Property 11: Perfect location, 2 pools, shops & beach! 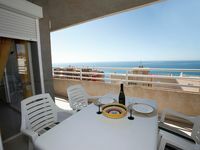 Property 16: Costa Blanca Calpe Beautiful apartment on the beach !! Property 27: Great Apartment, with wiffi, a / a, next to beach and promenade. The place is really splendid; apartment is located at 1st line, having perfect sea view. Beach is just under the window. The apartment is very clean, equipped with everyting needed to live. Large fridge, microwave, toaster, coffeemaker, all cookware, washing machine, etc. There is good FullHD TV, wi-fi. Parking is behind the building, with private access thru gate from the street, very convenient. Few stores just 300mts away to buy food and necessary stuff. Big stores (Mercadona, Masymas) are also accessible in 8-10 mins walking. There are two restaurants just under the balcony, but not noisy or smelly. The only noise you may be aware of is sand-cleaning tractor early in the morning. No pool, but who needs a pool, living at the sea? Maria (the host) is very friendly, solves all problems in a moment, She's very punctual, replies to all questions quickly and her apartment deserves 5+ mark.